Jeremy D. Miller has just announced the availability of StructureMap 2.5.1. This incremental release has a bunch of bug fixes and a few new features. * Fixed issue with With<T>(object).GetInstance<U>() functionality. This is now much more robust. * Patch for session lifetime. There is now an option for "CacheBy(InstanceScope.HttpSession)"
* A minor performance enhancement that stops StructureMap from doing a scan of all types on the StructureMap assembly itself. Jeremy also posted a list of items that he plans for the 2.6 release, and also says that this is a good time to ask for things. If you haven’t signed up for the StructureMap Google list be sure to do so and ask your questions there. The Northwest Arkansas Chapter of the Association of Information Technology Professionals is having a Holiday Social December 18th 6-9 PM at Beef O’ Brady’s in Bentonville, AR. This is a great time to mingle and meet other IT Professionals in the area. I am sure there will be more than a few war stories shared. 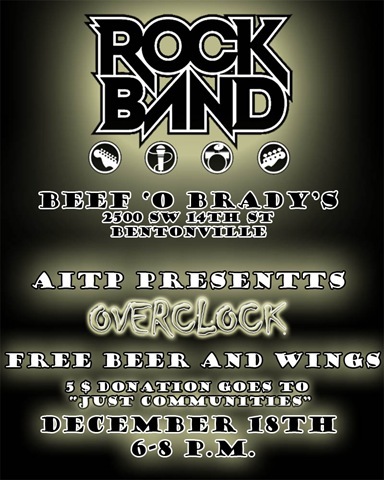 Another treat with be the music by OVERCLOCK, a local band you won’t want to miss, oh and I think Rock Band will be setup for the rest of us. The Association of Information Technology Professionals (AITP) offers opportunities for Information Technology (IT) leadership and education through partnerships with industry, government and academia. AITP provides quality IT related education, information on relevant IT issues and forums for networking with experienced peers and other IT professionals for nearly 9,000 members. AITP is the Information Technology professional organization of choice for providing leadership opportunities, professional development and personal growth. To find out more about the Northwest Arkansas Chapter of the AITP visit http://www.aitp.org/organization/chapters/chapterhome.jsp?ID=462 or http://nwa-aitp.org/.